 Vcodex are world experts in video compression. We provide essential analysis and advice on technology, strategy and intellectual property. Our input will help you get the most out of your video compression technology. Video compression is the technology behind moving digital images. It is essential to video on phones, cameras, laptops and TV. In fact, anything you can watch on a screen uses video compression. High Efficiency Video Coding (HEVC) is a new standard for video compression that has the potential to deliver better performance than earlier standards such as H.264/AVC. Source video, consisting of a sequence of video frames, is encoded or compressed by an HEVC video encoder to create a compressed video bitstream. The compressed bitstream is stored or transmitted. A video decoder decompresses the bitstream to create a sequence of decoded frames. Features to support efficient parallel processing. The result is a video coding standard that can enable better compression, at the cost of potentially increased processing power. An international standard for video compression. Developed by a working group of ISO/IEC MPEG (Moving Picture Experts Group) and ITU-T VCEG (Video Coding Experts Group), HEVC is an international standard, jointly published as ISO/IEC 23008-2 and ITU-T Recommendation H.265. HEVC is published as a document (the standard itself) together with a reference software implementation (the test model, HM). A format for compressed video. The HEVC standard specifies a format for compressed or encoded video sequences, together with a method for decoding this format. 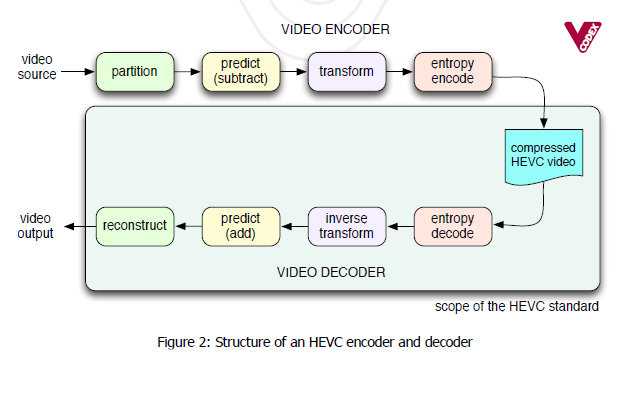 An HEVC-compatible video sequence should (a) meet the specification of the compressed video format and (b) be correctly decode-able using the method described in the standard. HEVC video sequences can be stored in media files, streamed over the internet, transmitted by broadcast, etc. Better video compression. 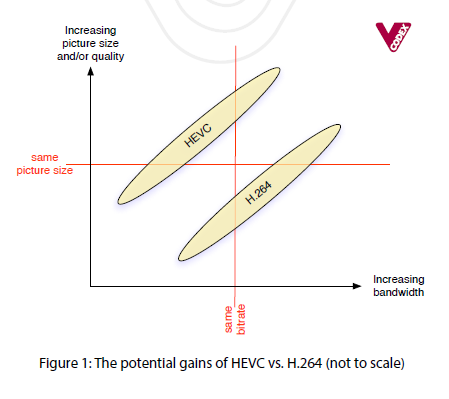 Depending on how the tools are used, HEVC has the potential to offer significantly higher compression than earlier standards such as H.264 / AVC. Achieving the best possible compression is likely to require significant computational resources. 3 Why do we need it? Widespread use of digital video, at increasingly high resolutions, which puts a significant strain on network capacity. Increasing use of video resolutions beyond HD, which will increase the burden on networks and storage even further. Continuing improvements in processing capacity. In 2013, a mobile handset or tablet is likely to have more computing power than a desktop computer from 2003. At the same picture size and quality, an HEVC video sequence should occupy less storage or transmission capacity than the equiv lent H.264 video sequence. At the same storage or transmission bandwidth, the quality and/or resolution of an HEVC video sequence should be higher than the corresponding H.264 video sequence. 4 How does HEVC work? HEVC is based on the same general structure as previous standards. Source video, consisting of a sequence of video frames, is encoded or compressed by a video encoder to create a compressed video bitstream. The compressed bitstream is stored or transmitted. A video decoder decompresses the bitstream to create a sequence of decoded frames. Entropy encoding the transform output, prediction information, mode information and headers. Reconstructing a decoded video image. The HEVC standard defines (ii) the syntax or format of a compressed video sequence and (ii) a method of decoding a compressed sequence. The actual design of the encoder is not standardised. HEVC supports highly flexible partitioning of a video sequence. Each frame of the sequence is split up into rectangular or square regions (Units or Blocks), each of which is predicted from previously coded data. After prediction, any residual information is transformed and entropy encoded. Each coded video frame, or picture, is partitioned into Tiles and/or Slices, which are further partitioned into Coding Tree Units (CTUs). The CTU is the basic unit of coding, analogous to the Macroblock in earlier standards, and can be up to 64x64 pixels in siz . A Coding Tree Unit can be subdivided into square regions known s Coding Units (CUs) using a quadtree structure (Figure 3). Each CU is predicted using Inter or Intra prediction and transformed using one or more Transform Units (see below). 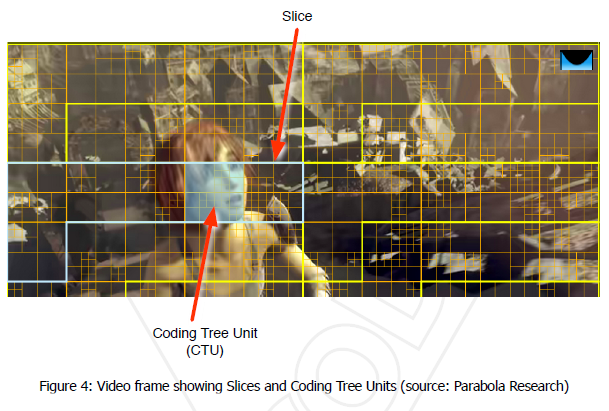 Figure 4 shows a video frame partitioned into slices, with one slice highlighted in blue. The highlighted slice contains six 64x64 CTUs. 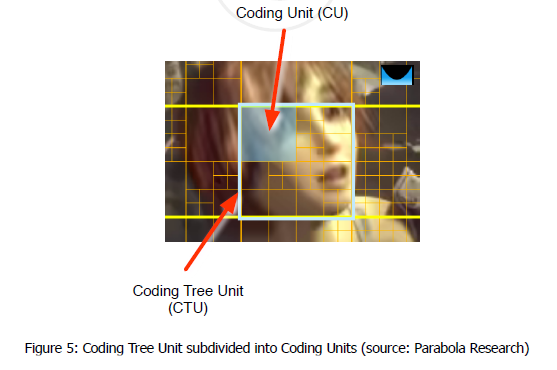 Figure 5 shows a close-up of the CTU highlighted in Figure 4. The 64x64 CTU is split into four 32x32 regions, with the top-left 32x32 CU highlighted. In the other four quarters, the 32x32 region is split further, to 16x16 or 8x8 CUs. 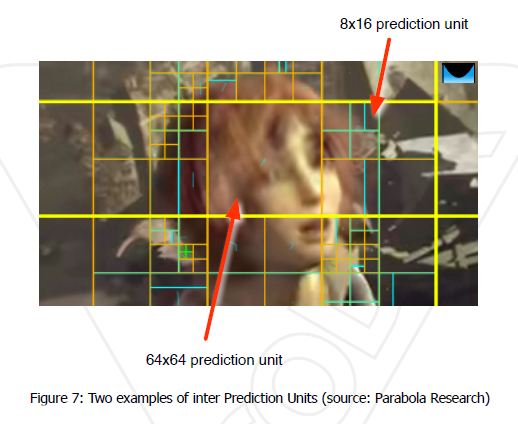 Frames of video are coded using Intra or Inter prediction. 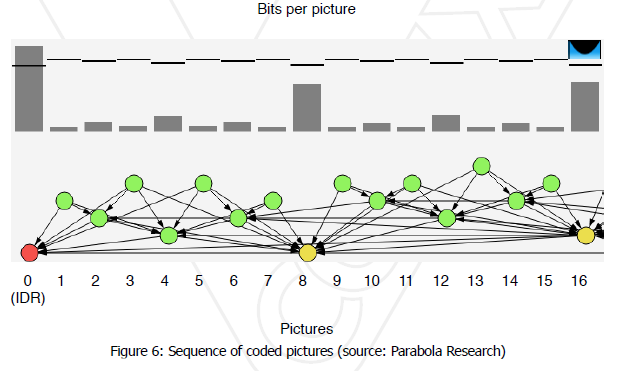 Figure 6 shows a sequence of coded video frames or coded pictures. The first picture (0) is coded using Intra prediction only, using spatial prediction from other regions of the same picture. Subsequent pictures are predicted from one, two or more reference pictures, using Inte and/or Intra prediction for each Prediction Unit (PU). The prediction sources for each picture are indicated by arrows. Each Coding Unit (CU) is partitioned into one or more Prediction Units (PUs), each of which is predicted using Intra or Inter prediction. Intra prediction: Each PU is predicted from neighbouring image data in the same picture, using DC prediction (an average value for the PU), planar prediction (fitting a plane surface to the PU) or directional prediction (extrapolating from neighbouring data). Inter prediction: Each PU is predicted from image data in one or two reference pictures (before or after the current picture in display order), using motion compensated prediction. Motion vectors have up to quarter-sample resolution (luma component). 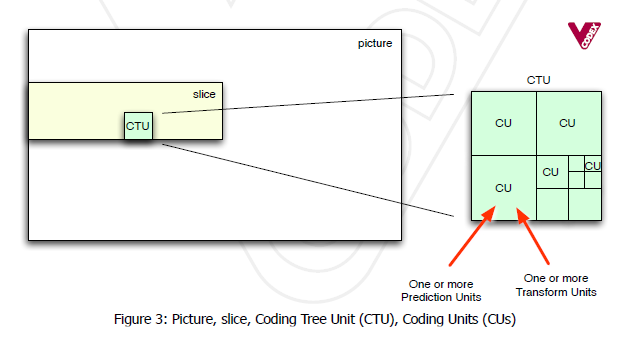 Figure 7 shows two examples of Prediction Units. The CTU in the centre of the Figure is predicted using a single 64x64 PU. All the samples in this PU are predicted using the same motion compensated inter prediction from one or two reference frames. Shown on the right is an 8x16 PU, which is part of the prediction structure for a 32x32 CU.